- Need One Stop Shopping? We have 40 years of experience and we can and often do handle it all. While we don't do exactly everything, once we know what you need we will be able to quickly answer your questions or explain who would be best in class to help. We are the established experts in LGBT media planning and placement for print, digital and mobile platforms. We have been helping Advertising Agencies and Companies nationwide to maximize their advertising spend by targeting the LGBT segments that matters most to them. Rivendell Media provides a complete picture of all the available outlets and houses all the major research Agencies and Clients would need to pitch and service their clients and customers making it simple easy and most of all profitable to reach the LGBT consumer. We make it our mission to understand the nuances of gay media consumption and consumer behavior based on region, income, relationship status, buying habits, cultural interests, age, and other factors. And we have longstanding relationships with the LGBT publications and platforms you want to be in. Most importantly, we know how to reach the tastemakers and influencers you most want—whether it’s through digital, print, broadcast, or app-based platforms. Because we make a point of knowing precisely how, when, and where they consume media. So we can deliver valuable research insight directly to you for the best results. We can develop a marketing strategy that will help elevate your brand into a more meaningful and profitable position within the LGBT segments you choose. RECENTLY IN THE NEWS This section of our site is a collection of articles containing tips and trends in advertising to gay consumers and articles that feature Rivendell Media in the news. Todd Evans has been involved with the gay and lesbian press for many years, first working for and then taking over as President and CEO of Rivendell Media. Rivendell, founded in 1979, represents most gay and lesbian publications and web properties in the United States and Canada for national advertising. In 2001, Todd purchased Q Syndicate, the leading content provider for gay and lesbian media, and he maintains a partnership in that company to this day. Todd is also publisher of the gay media industry newsletter, Press Pass Q. As the leading expert in gay and lesbian media, Todd brings his incomparable level of experience to both clients and publications alike. Rivendell Media applies extensive market research and trend awareness to develop highly targeted media strategies. 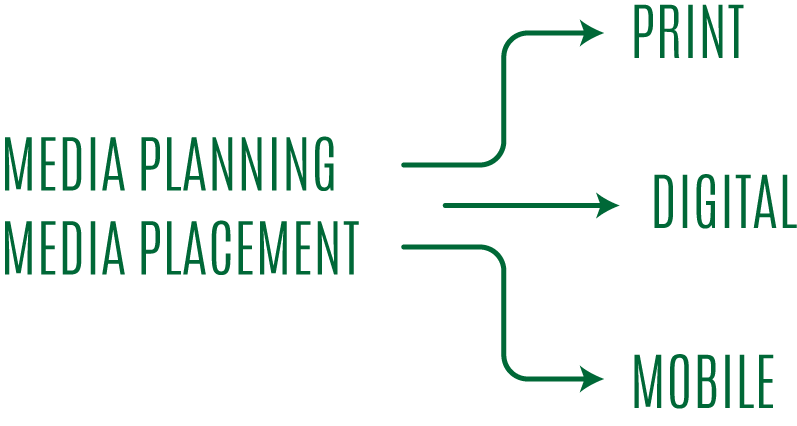 Giving you informed recommendations and helping you plan campaigns for maximum success. Each campaign is custom designed with the right mix of print, digital, and mobile channels based on your needs, whether you want to focus on a key demographic or regional market, or you want full nationwide coverage. You can leave the hard work to us and watch the results. We can develop a marketing strategy that will help elevate your brand into a more meaningful and profitable position within the LGBT segments you choose. Our Competitive tracking reports are found no where else and provide you insight to what other companies are doing in your category of interest. 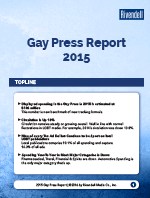 These reports are updated daily and by quarter and year providing a complete picture of what is actually being placed in LGBT or HIV/AIDS media now or in the past. We make a point of keeping your media buy simple, fast, and streamlined. Providing you with art-specs, tear-sheets, screenshots, and deadlines for review. Because we work directly for the publications and digital properties we represent, our rates are guaranteed to be the lowest available and are always agency commissionable. Our billing is simple and easy and can be customized to meet your needs. This means you get easy access to every lgbt oriented print, digital and mobile publication or platform that matters through a single rep with one bill. 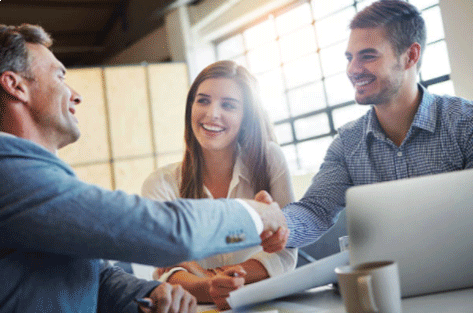 YOU DON'T NEED TO HIRE A SPECIALIZED CONSULTANT. We work in an objective, consultative way to provide you with informed marketing recommendations based on our extensive experience in the gay media space. As part of our standard service offerings we house extensive, independent market research regarding media consumption trends in the gay community. 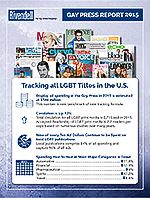 While in many other sectors it’s true that print is losing audience to digital properties — studies show that print is still king in actual LGBT media consumption. We also leverage 40 years of expertise to help you make the most effective media buys based on a wide range of parameters. Most marketing consultation is free. Ad agencies and corporations trust Rivendell Media as their go-to expert for gay media placement. LGBT Events/Sponsorships are constantly changing - what is the best one year might not even happen the next. Best to call and we can assess your needs. Please call 908-232-2021 and speak to a team member. QUICK INFORMATION YOU CAN USE RIGHT NOW FOR YOUR CLIENTS AND OR PITCHES. Rivendell Media represents about 95% of gay and lesbian and HIV/AIDS publications. We also represent a host of digital properties, starting with the publications’ websites but also including standalone sites, digital networks, and mobile options. If you need to know what is available, call or e-mail us with your agency name, address and complete contact information, and the markets you are interested in. We will provide a complete list, including rates, circulation, frequency, and type of publication as well as what we would recommend for the type of advertiser. We will provide this information for 100% of publications whether we represent them or not. 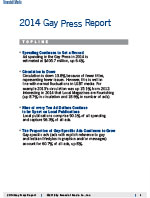 Published annually since 1994, the Gay Press Report compiles all advertising activity and spending in the LGBT press for the current year. 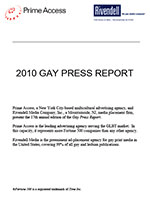 The report includes all known publications in the United States that exclusively target the LGBT market, regardless of representation by Rivendell. Please feel free to download copies of past reports from the archive below. We track all national ads in every gay, lesbian and HIV/AIDS publication in the US and Canada. We have the following categories and many others: Pharmaceuticals; Alcohol and Spirits; Airlines, Cruises, and Travel Transport; Travel Services and Tourism; Hotels, Resorts and Lodging; Auto Sales and Services; Financial and Insurance; Apparel and Fashion Brands; Beverages; Cigarettes, Tobacco, and Anti-Smoking; Entertainment; Computers and Electronics; Education; Fitness and Health; Food Services and Restaurants; Online Services and Social Sites; Condoms and Lubricants; Grocery Stores, Pharmacies & Convenience Stores; Hair Products, Body Products, and Personal Hygiene; Non-Profits; Phone, Internet, and Cable; and Pet Products. These are available free to agencies that use us. If you are pitching an account, we will still provide the reporting for free as long as we know who the client is. All information is kept confidential. Just click on the form button and fill out the form to get your free reports. Or just call us at 908.232.2021. Rivendell Media is proud to present the services of our strategic partner, Community Marketing & Insights (CMI). Founded in 1992 and based in San Francisco, CMI has served industry leaders around the globe with LGBT consumer market research services, strategic consulting, and corporate training. Research has proven to be among our clients’ most cost-effective investments into LGBT outreach, as it informs your messaging, imagery, offer, product development, etc. and provides valuable feedback on past, current and prospective initiatives. In cases of tracking market position and growth, surveys can provide a benchmark against which future growth can be measured. We craft in-depth surveys to reveal unique information that applies specifically to your market and your competition. We build the surveys using state-of-the art software, and distribute them via our own proprietary, and highly qualified, panel. 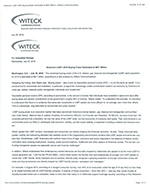 Our reports contain the resulting data, analysis, key findings, and recommendations based not only on the numbers, but also includes insights and experience gained over 22 years of LGBT market research. Cross-tabs are subsets of the full research data, specific to a targeted demographic, geographic region, etc. Cross-tab reports are full data reports including charts, summaries, key findings and recommendations. Examples of cross-tabs may include lesbians, high income, LGBTs with children, senior LGBTs, etc. Cross-tab reports help our clients identify growth potential, sensitivity issues, motivations, etc. that may be unique from the full field of survey participants. We pre-qualify candidates using our survey software, then hone in on a focused cross section of customer experiences. We facilitate sessions of 8 to 12 participants in dedicated venues in our clients’ key markets such as San Francisco, Los Angeles, New York City and others as required (you’re welcome to observe). Savvy LGBT consumers provide qualitative depth and perspective to what we learn from quantitative surveys. “Virtual” focus groups via the internet may also be of interest, to reach and understand the motivations and perspectives of LGBTs not living in urban centers. These methodologies further round out our understanding of your gay and lesbian customers, taking advantage of specific timing, places and situations that can reveal important intelligence. Beyond research as a means of preparation, planning and positioning, CMI offers educational and training workshops for our clients’ executives, sales and marketing teams, investors/stake holders, and front-line personnel. We also present at regional and national meetings, conferences and conventions. 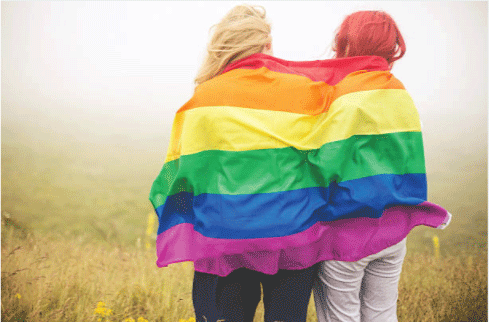 Rivendell’s longtime partnership with Community Marketing & Insights – the leading LGBT research company gives you many simple options – to support the LGBT communications initiatives of companies pursuing the LGBT market. Community Marketing & Insights (CMI), founded in 1992, is a full-service LGBT researcher that has produced market studies for leading brands such as Wells Fargo Bank, Johnson & Johnson, Hawaiian Airlines, Hallmark, DIRECTV, Target, The Walt Disney Company and many more. CMI operates its own proprietary, community-representative panel of over 70,000 LGBT consumers. For $10k, you can add four brand recognition and category-competitive environment questions into CMI’s 10th Annual LGBT Community Survey® study (fielded every year from April 15-May 31) to gauge your current LGBT position in the U.S. marketplace. This can serve as a baseline, and to measure communications traction and market share growth year over year. Option 2: 'Quick Pulse' custom survey. For $15k, a mobile-optimized Quick Pulse includes up to 15 custom questions plus 4 demographics questions (maximum 7 minute LOI), to help determine best market matches within the LGBT community (e.g. analysis by generations, geography, gender identity, relationship status, families, etc.). 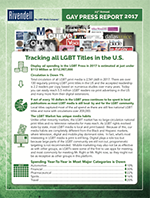 The Quick Pulse yields 600+ U.S. completes, sufficient for CMI to run comparison analysis by LGBT demographic segments. Costs may increase for fielding in other countries. Option 3: Full custom studies. This may include comprehensive surveys, in-person and virtual focus groups, in-depth interviews, etc. are available to design and implement for a range of $35k and up. We all work as a team and anyone will be able to help you or direct you to the correct team member. 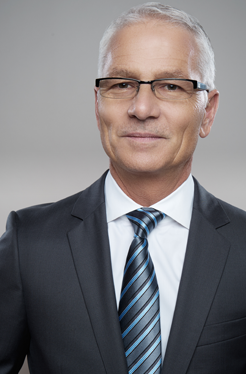 Want to contact the President & CEO? Send us your message - we will respond soon. Let us know a little bit about what you are looking for, as well as which categories you are interested in, and we will compile the information and get back in touch with you.